After reading this and this, I concluded that high-end art is a form of currency for elites. Art museums and critics encourage us peasants to believe the value in these “priceless art treasures” is based on utility (i.e., the more they cost, the more “genius” they contain). But the value of high end art is due to collectors attaching their surplus capital to it. “During the 1980s, Charles Saatchi started to corner the market by buying up the inventory of one artist, such as Sean Scully, and then dumping the work en masse, presumably for economic gain. Now, collectors such as Daniel Loeb and Aby Rosen also assemble dozens of works by a single artist (Loeb has close to 300 Martin Kippenbergers), but they have so much money that art collecting is a game for them that mimics their larger financial speculations. Using a hedge model, these collectors are able to manipulate the valuations of their holdings based on their internal financial realities, not on any outside demand per se. That is what hedging is.” ibid. “increments of $100,000 are to today’s contemporary art market what $10,000 was in the 1980s and $1,000 was in the ‘60s.” ibid. But that’s what I had to work with. In fact the $10,000 bill isn’t in circulation today. But it does look like “money” (unlike the $100,000 Gold Certificate) so in that way it fits the bill, so to speak. Ironically (for ironic juxtaposition!) 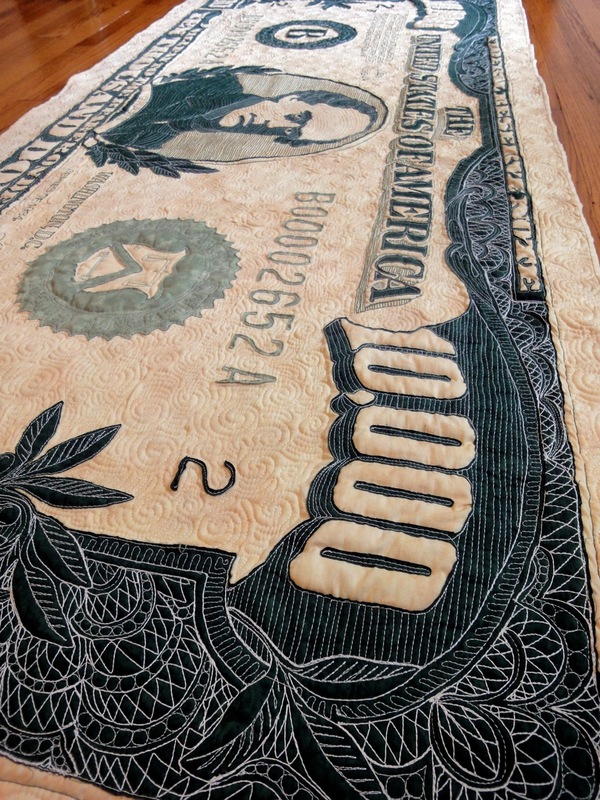 quilts are among among the most under-valued art forms. They also require more skill and time than almost any other art-making technique I’ve tried. 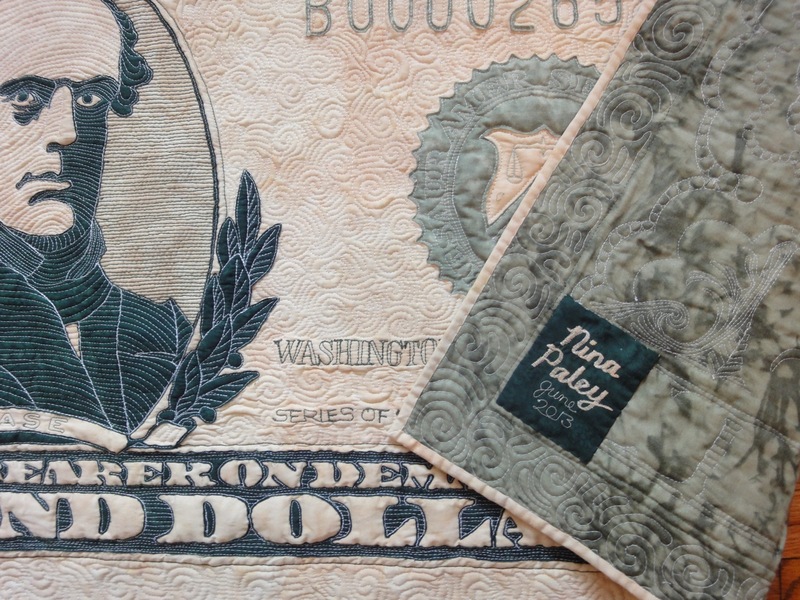 The selling price of quilts seldom covers the costs of materials; quilters often prefer to give their quilts away. 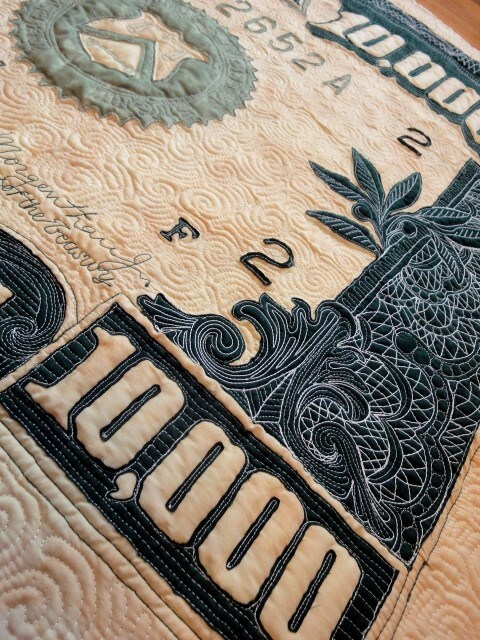 An “expensive” quilt usually costs more than the value of materials, but less than minimum wage for labor. I recently met a master quilter whose beautiful wall quilt, which took months of expert work and won many awards, was professionally appraised at $3,500. This is considered very high; had it not been widely displayed and won many awards, it would be “worth” far less. Betty Busby is an art quilter I admire whose works have broken through the “high” end of quilt prices into the “bargain-basement low” end of art prices. 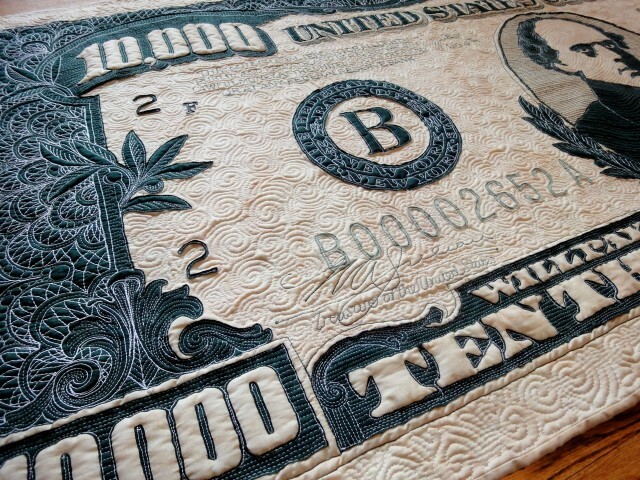 Is it because quilts have so much utility (“use-value”) that they can’t get traction as high art? Is it because quilting is historically “women’s work”? Is it because quilting is often kitschy, popular in the middle-class Midwest that many aspiring art-worlders move to New York to get away from? 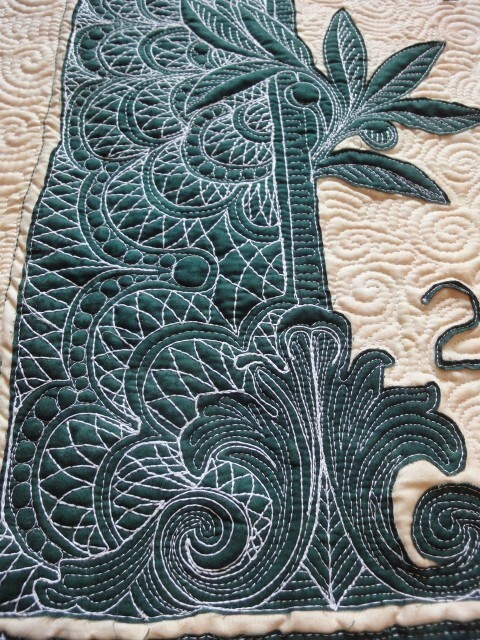 Is quilting too white? (The now-famous Gee’s Bend quilters would be an exception to prove this rule.) Is it because many quilters are insane about copyright, going out of their way to restrict knowledge of their work? Who knows. Meanwhile, here is a Ten Thousand Dollar quilt. P.S. This sucker was a ton of work. The Muse made me do it. A master quilter I ain’t. Quilt appraisers would scoff because I don’t properly tie off and hide my threads, and because there are some puckers and pleats in the quilting. But if I billed the hours I put into this as an animator, I would invoice more than $10,000. P.P.S. Bargain (Ten Thousand Dollars) will be on display at my upcoming Art Quilt Show at Sleepy Creek Vineyards. Nina, Your work is amazing, article is great. You never stop amazing me. Keep up the good work. Wonderful work of art and article Nina. It rings totally true. I’ve been thinking lately about the artificial nature of money and how ridiculous it is that so few are allowed to amass such ungodly amounts of wealth. I really think there should be a limit on personal wealth. I think it would solve many problems. It could be pretty high – like 50 or 100 million. But anything after that goes back to the public. In the 1950s I believe the highest tax bracket was in the 90% range. No one accused Eisenhower of being a communist. Anyway – great work and essay Nina! 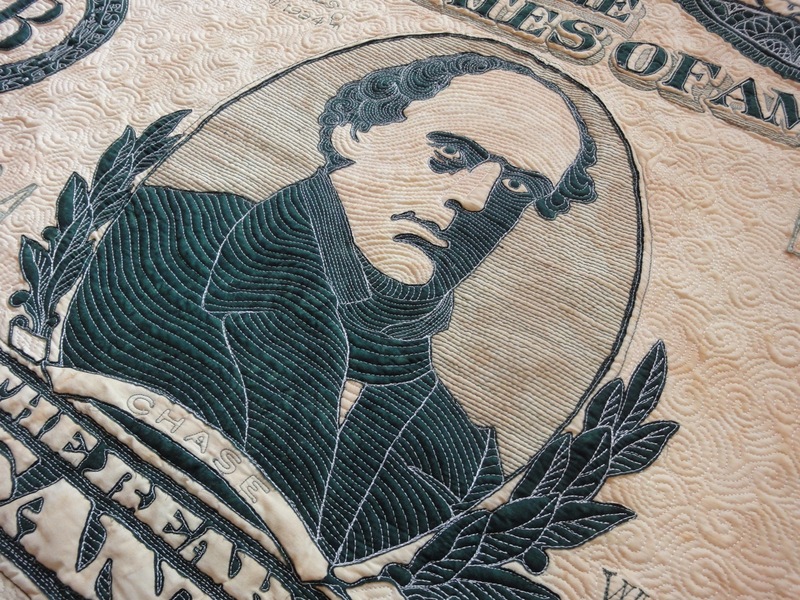 Oh that is an utterly fantastic quilt. I also saw that your air quilt won people’s choice for the bloggers quilt festival.. You do amazingly clever work. I’m inspired. I don’t have an actual $10K note handy at the moment with which to compare, (I find my Tritium AMEX card is all I need nowadays) but it seems Chase has taken on a very ghoulish countenance. I do hope you’ve not editorialized here, this piece’s value will decline should it be deemed critical of such an icon of our class. I’ll see to it personally. Did you check to see if you could get arrest for counterfeiting? Beautiful and funny too! And it comes with its own deep and insightful blog post. This is good art! 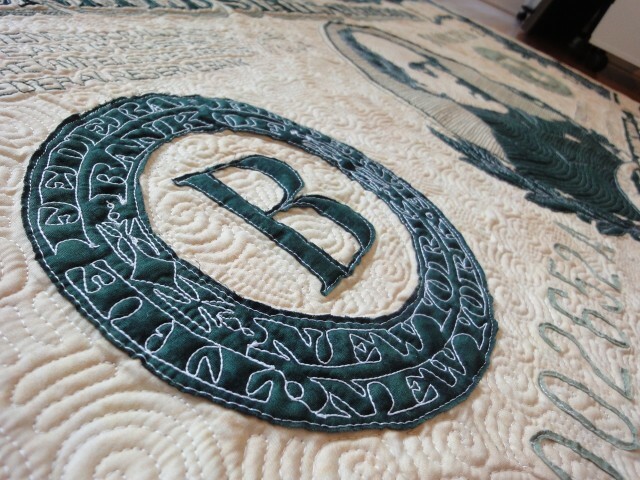 Amazing quilt, and UH-mazing quilting! The details are incredible. I wish I could come see it in person at the quilt show! Hi Nina, I know you don’t do requests but have you thought about producing a Mimi & Eunice quilt? 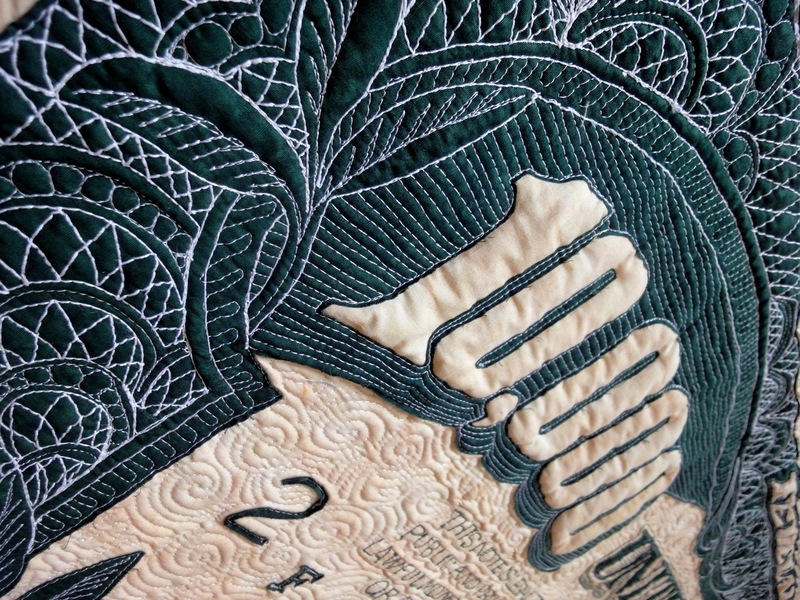 Fantastic quilt and great article too. Great post! And the quilt is absolutely amazing!! seems to be the anti-bitcoin. very physical. definitely money. non-negotiable.